Date nights with the hubby have been far and few between. Now that our little one is 2 years old, we are getting out a little more often than we had in the past. Our latest date adventure was so exciting and so much fun, that I had to share! 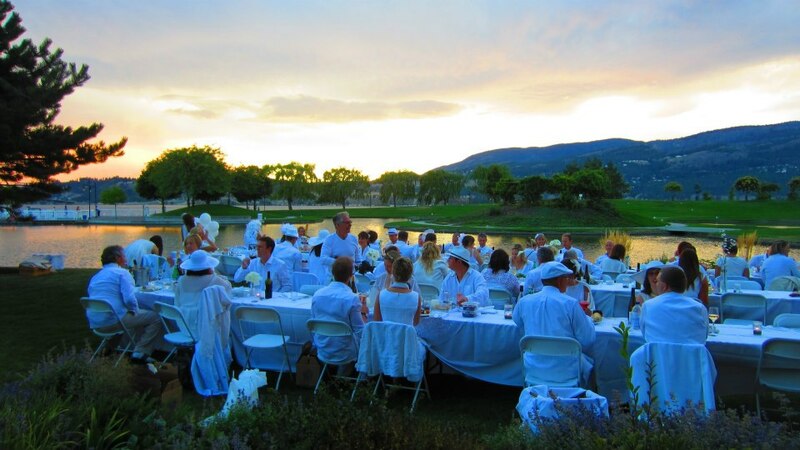 Last week, my husband and I attended an event called the Okanagan White Dinner. This is based on an existing event that is spreading around the world called “Le Diner en Blanc”, essentially a picnic dinner party. It is a throwback to elegance and refinery. A time when we dressed up to go out, a time when even a picnic included fine china and glassware and a time when we honored our commitment to attend a dinner party. This all started about 20 years ago when the founder encouraged guests at his annual dinner party to bring a friend, eventually they outgrew his home and had to move the event to a public place. Since the host didn’t know everyone who would be attending, he asked everyone to wear white in order to be easily recognized. The rules are simple, you must wear all white. Your picnic dinner that you bring must consist of 3 courses and it must be served on white china with real wine glasses and real cutlery (no paper or plastic allowed!). And if you register, you must attend or risk being blackballed from the invite list for life. This inaugural event was magical! First we showed up at a location that was disclosed to us 2 days prior to the event, where we were to potentially meet shuttles to take us to the dinner site. This year’s location was within walking distance of where we were to meet for our group, although there were shuttles coming in from communities in the north and the south. We were greeted with lovely live jazz music and rows of tables draped in white linen table cloths. We then proceeded to set up our “picnic” area. 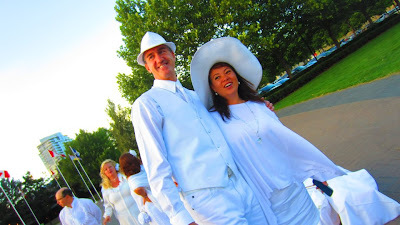 And then in true “Diner en Blanc” fashion, we showed approval of the venue by twirling our napkins in the air. (hence the need for linen, not paper, napkins:) ) It was a wonderful evening, dining under the stars with beautiful music in the background and good friends in attendance, definitely a night to remember. And, in appreciation of our host, we lit sparklers to signify the end of the event! Not only was our evening spectacular, but it also came with a great story! Sunday night was the night of the Peachland Fire, where the highway from the south to Kelowna was closed. 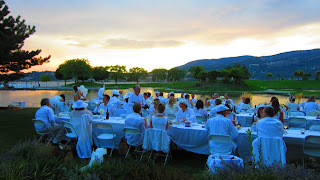 So in true “Diner en Blanc” fashion, one of the participants of the Penticton group offered the use of his home where they all congregated with their picnic dinners to enjoy an impromptu dinner in white. And from the pictures I saw of their napkin twirl, they definitely approved of the venue! Thank you to four local foodie women in our community for bringing this great event to the Okanagan. Jennifer Schell, Christina Ferraira, Claire Sears, and Alison Love. And since this was the first event of its kind in the Okanagan, this year was unofficial but from the turnout I am sure they will be on the official circuit next year! To participate in this event, you must be registered to receive an official invite. Invitations are limited, only 70 were sent out this year (each invitee gets to bring an additional 3 people). But for next year, they have opened up the invitation list...so if you are interested in participating next year...get on the list now! Shoot me an email to themellowmama@gmail.com and I’ll send you the link! :) Bon Appetite! This blog post can be seen on www.okanagan4kids.com.